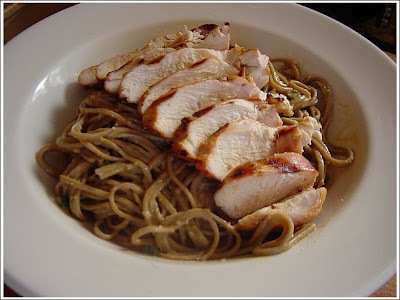 My friend John recently passed me a wonderful recipe from Cook's Country Magazine for grilled chicken with sesame noodles, which hit the dual bullseye of being both easy to make and extremely good. Cold sesame noodles make a great dinner on a warm spring or summer evening. They can be topped with different meat and veggie combinations, eaten plain as either a main course or a side, and I'm sure leftovers would make and excellent lunch (if you have any leftovers that is - I haven't). This particular recipe gets the flavor just right with a sauce that perfectly blends salty, sweet, spicy, and peanut-y tastes...sounds good right? The second time I made this recipe, I decided to go the vegetarian route, with excellent results. Topped with stir-fried tofu, and crunchy, colorful red peppers, carrots, and snow peas, this dish is full of healthy fats and protein, and bursting with flavor - a real winner. Usually I'm all about mise en place, but I'm comfortable prepping ingredients as I go along with this one, as timing is not too crucial. Just rinse all your veggies before you start and put a large pot of water on to boil and you'll be fine. So go ahead and mince the garlic and ginger, then combine it in a bowl with the soy sauce, rice vinegar, hot sauce, brown sugar, and sesame oil, then whisk everything to combine. Set aside 3 tablespoons of the sauce for later use. Cut the carrots, red pepper, and tofu, then toss them together with the snow peas and the 3 tablespoons of sauce. Puree the rest of the sauce with the peanut butter in a blender until smooth. Put your noodles in the boiling water and slice the scallions while the noodles boil. Drain the noodles, rinse them with cold water, and then drain them well. Toss the noodles in a large bowl with the pureed sauce and the scallions. If you are not going to be serving for a while, place the noodles in the fridge, just remember to take them out about 15 minutes before you're ready to eat so that they are not ice cold. Heat the oil over high heat in a wok style pan until it is shimmering. Add the tofu and vegetables and stir-fry for a few minutes, until the vegetables are just tender. 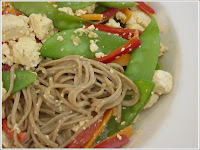 Place about 1/4 of the noodles in a bowl and top them with the stir-fried tofu and vegetables. Here's a picture of the alternative, non-veggie version with chicken. Just marinate some boneless, skinless chicken breasts (about 1 1/2 pounds) in the separate 3 tablespoons of sauce, then grill them, slice them, and serve them on top of the noodles.